Who We Are – Rollin Tide Boil Co. 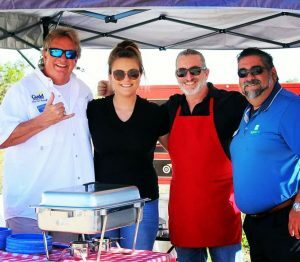 In the winter of 2016, after returning from a trip to the Virgin Islands, an idea for a new way to enjoy dining on The Beaches of 361 in The Coastal Bend was conceived. Kassie Smith and Shawn Taylor, who had recently began dating, had moved to North Padre Island (outside of Corpus Christi, Texas) where Kassie was taking a semester off from The University of Texas (Austin). Kassie had decided to switch her major from nursing to business. 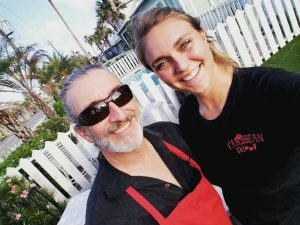 While driving down Highway 361 Shawn, who had owned businesses previously, told her, “If you really want to learn about business, the best thing for you to do is simply start and run your own business.” And that… is precisely what Kassie set out to do. Shawn was raised in Alabama and spent a lot of time vacationing on Scenic Hwy. 30A near Destin, Florida where he often cooked Shrimp Boils for friends and family. At the Boil & Bonfire events, they soon learned families tended to turn off their cell phones and reconnect with each other instead of social media, work, etc… This was what they had sought to create, and it had now happened. The couple worked hard that first summer facing many challenges, but at the end of the season they knew they had created something very special and unique for their guests. During the fall of 2016 while on a trip to the British Virgin Islands, on Jost Van Dyke, they got engaged!! They both also had fallen in love with the U.S. Virgin Islands and decided to move there (during the winter months) and open Kassie’s second location of Rollin’ Tide Boil Co. Kassie worked on setting up the business, while Shawn worked on his captain’s license as a crew member taking tourists on excursions to surrounding islands in The US and British Virgin Islands. 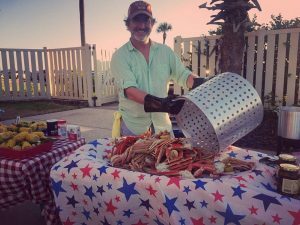 In the Spring of 2017 they returned to North Padre Island & Port Aransas again where the business grew due in large part to past patrons of their dinners telling their friends about their experiences. That summer it was obvious they were a success now. Then, on August 25th, 2017 Hurricane Harvey (Category 4) packing winds of 135 mph hit The Coastal Bend tearing up many areas, but particularly the vacation town of Port Aransas. With no rooms for their guests to stay in, people who had booked with Rollin’ Tide Boil Co. for September and October called and cancelled reservation after reservation. However, the couple took solace in the fact they had the second location in The US Virgin Islands to return to as a source of income. But then, 13 days later on September 6th, 2017 Hurricane Irma (Category 5) with winds in excess of 185 mph hit The United States Virgin Islands and devastated Shawn and Kassie’s home island of St. Thomas. They knew that returning to the USVI would not be possible now. So, the couple refocused their marketing from tourists to locals. They started hosting boils for graduations, Christmas parties, etc. 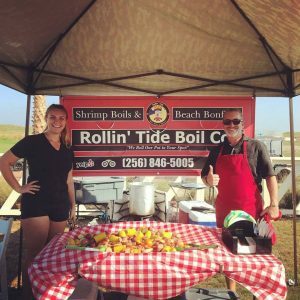 They even took their motto of, “We Roll Our Pot to Your Spot!” literally and traveled as far away as Austin, Round Rock, & Belton, Texas doing backyard Shrimp Boils for past beach guests who were kind enough to hire them. One group even hired them to cook a Shrimp Boil for a tailgating party in College Station for a Texas A&M football game. With not many bookings in the winter, Shawn returned for a short stint to work as a Project Superintendent on the Corpus Christi Harbor Bridge Project, as Kassie continued to grow the business. Although there have been challenges, the couple begin this third summer full of hope and excitement for the upcoming season. This year due to numerous bookings, they have even hired a staff of assistants to help them meet their growing demand. Rollin’ Tide Boil Co. will continue to prosper and host your family’s special moments for years and years to come! !